aGupieWare: Space Station Sunday: Supermoon! The astronomical phenomena known as a "supermoon" occurred earlier this week, giving humans both on Earth and in space the chance to gaze on the biggest and brightest view of the moon seen in 20 years. The supermoon occurs when the moon is at its perigee, a.k.a. the point closest in its orbit to the earth (the scientific name for the supermoon is "perigee moon.") That put our nearest astronomical neighbor a mere 221,765 miles away from us, making it appear 30% brighter and 14% larger, according to a report published on www.independent.co.uk. The supermoon was prominent indeed to our intrepid heroes on the ISS, and was captured in all of its super, moony glory by several astronauts. Oleg Artemyev, a Russian cosmonaut aboard the ISS, snapped a series of images of what he called the "moonset", including the dramatic shot below. German ISS astronaut Alexander Gerst also captured the event, posting an image of the supermoon behind the spacecraft to his Twitter feed. Meanwhile NASA posted this patriotic take on the phenomena. It's even red, white, and blue! Of course, because Americans reached the moon first. Earthlings got in on the action too, with space.com featuring an array of astral awesomeness captured from the ground during the supermoon. Moon enthusiasts (lunatics?) can check out even more cool supermoon pictures from weather.com. The supermoon was so bright that even while it was waning, it outshone another major astronomical event last week: the Perseid meteor shower. 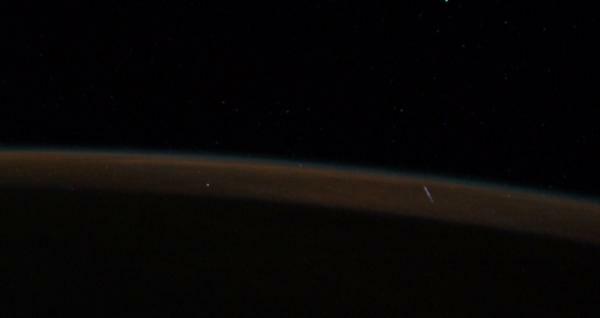 But don't worry, astronaut Gerst had a good enough view to capture a subtle but still cool bit of that too, explaining "Here's what a shooting star looks like from the side!" You get to make extra wishes on shooting stars seen from space.